Fiery as ever, Jonathan Papelbon celebrates after closing out the Red Sox on Wednesday night. PHILADELPHIA — Three days into the season, Jonathan Papelbon was still pulling things out of a box, getting his locker in order. He had his Ric Flair action figure flexing on the shelf and a World Championship Wrestling belt hanging from up top. He pulled out a pink “Nature Boy” robe, purple feathers fluttering out, Flair’s autograph in black magic marker on the back and hung it next to the belt. The setup was essentially an upgraded version of the shrine to Flair that Dustin Pedroia made for himself in the Red Sox clubhouse in 2011 and, in a way, it made sense. Even after the three seasons, 197 games, 106 saves, and 212 strikeouts in a Phillies uniform, the seven seasons Papelbon spent in Boston are still a part of his baseball DNA. It’s been four years since Papelbon signed a four-year, $50 million contract with the Phillies, leaving behind the River Dance, the Dropkick Murphys, and the “Cinco Ocho” alter ego that made the 34-year-old closer one of the most colorful characters in the Sox clubhouse. Since then, he’s gone from being the playful, young flamethrower at the back end of the Sox bullpen to the polished, veteran charged with leading the Phillies’ corps of relievers. He’s had to do it through some of the Phillies’ leaner years. In Boston, he reached the playoffs in four of his first five seasons. 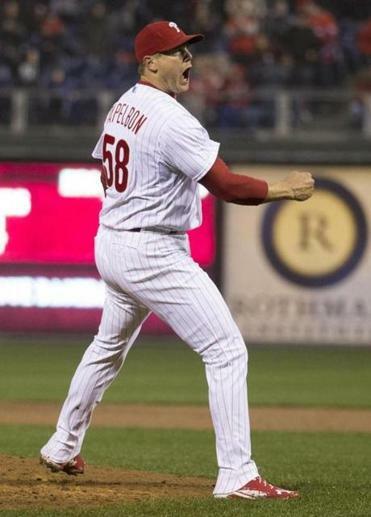 The Phillies haven’t had a winning season since Papelbon arrived. On the field, Papelbon has matured into a more complete pitcher, he said. Though his strikeout totals have been down the past two seasons (57 in 2013, 63 in 2014 after having 92 in 2012), his 39 saves last year were the fifth-most in the National League and second-best total of his career. Papelbon entered the season second on the Phillies’ all-time saves list with 106, and after closing the door on the Sox in the Phillies’ 4-2 win on Wednesday, he needs just six more to pass Jose Mesa for the franchise record. From David Ortiz to Dustin Pedroia, Papelbon still has friends in the Sox clubhouse that he keeps tabs on. Another close friend, Clay Buchholz, is in a new position as the Sox ace this season, and Papelbon could relate to Buchholz adjusting to a different role with more responsibility. Papelbon still remembers his years with the Sox, leaning on veterans such as Mike Timlin, Tim Wakefield, Keith Foulke, and Alan Embree. Now, he’s the second-oldest pitcher on the Phillies’ 40-man roster, and the younger arms are looking to him for guidance. “I feel like with this bullpen here, it’s just been some young guys that have looked up to either me or other older veterans in our bullpen throughout the last three years,” Papelbon said. Papelbon cleaned things up for the bullpen in the eighth, coming on with two outs and the bases loaded to face Hanley Ramirez (who had mashed two homers Monday night) after Ken Giles walked in a run. It took two pitches for Papelbon to sit Ramirez down, and even though Ramirez took the second one to the warning track in left, Papelbon didn’t flinch. He tossed a clean ninth to notch his first four-out save since 2013. When asked again after the game about still identifying more as a Red Sox than a Phillie, he initially played coy. Then he explained one last time. “For me, it’s like where are you from? I’m from Baton Rouge, Louisiana. So that’s what I will always say. That’s where I feel like I’m from. That’s where I grew up. That’s where my roots are.